Let’s face it, dessert is a must. With this healthier cheesecake recipe dessert doesn’t have to mean blowing your healthy lifestyle. We all know how much I love the Instant Pot and this recipe is no different. Instant Pot cheesecake is quick, easy, and I feel good knowing that it aligns with my healthier dietary goals. I enjoy taking everyday recipes and turning them into a quick and healthy alternative. With this Instant Pot cheesecake the crust really blew me away. 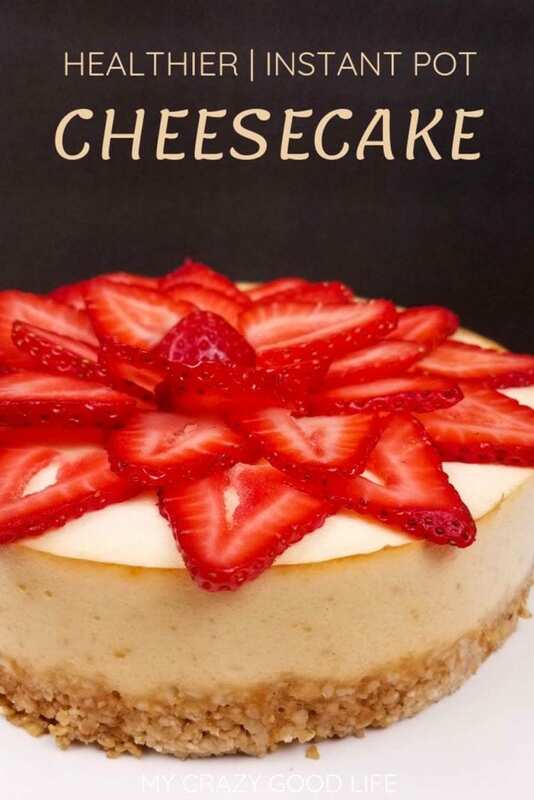 The granola does such a great job and it holds up well to the creamy texture of the cheesecake. 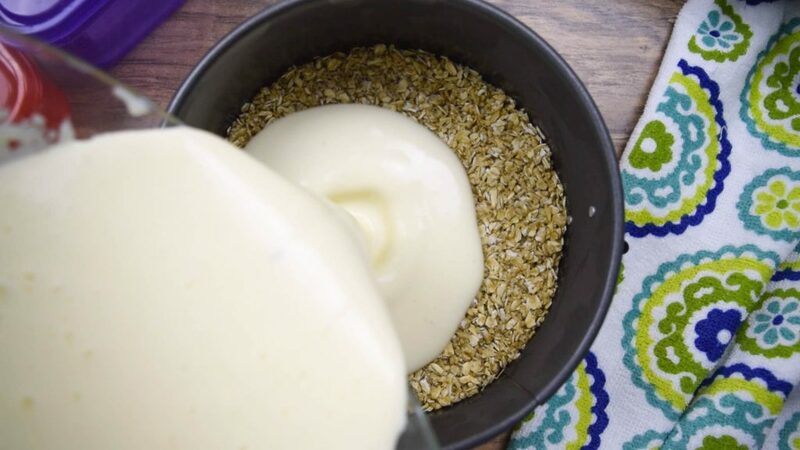 Using cottage cheese and vanilla Greek yogurt also cuts unnecessary fat and calories from this recipe! 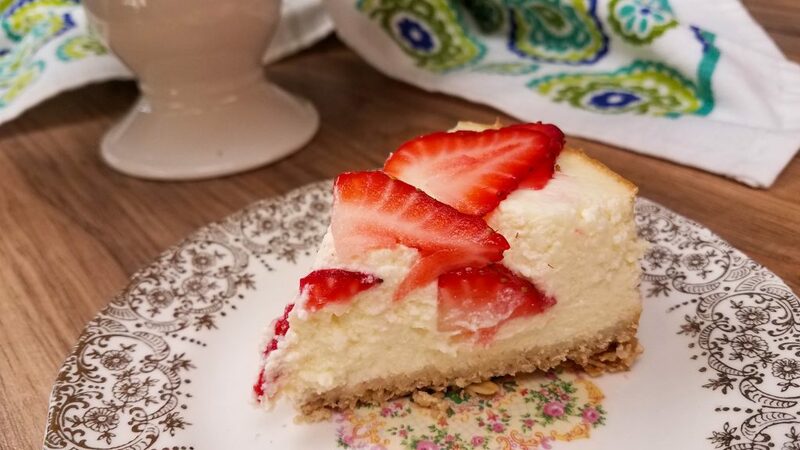 Instant Pot cheesecake will make you believe in the power of a delicious recipe, ready in minutes, that the whole family will devour! If you love healthier dessert recipes make sure to check out these banana oatmeal chocolate chip cookies, 21 Day Fix Desserts, and 21 Day Fix Desserts with No Yellow Containers! 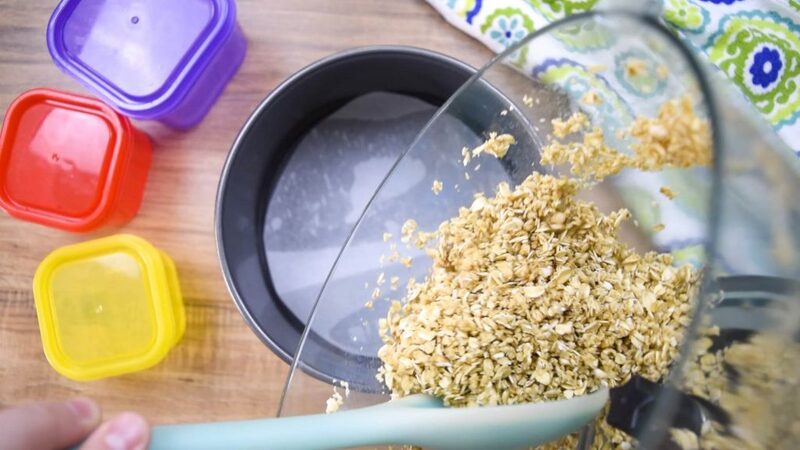 In a food processor or blender combine the ingredients for the crust. 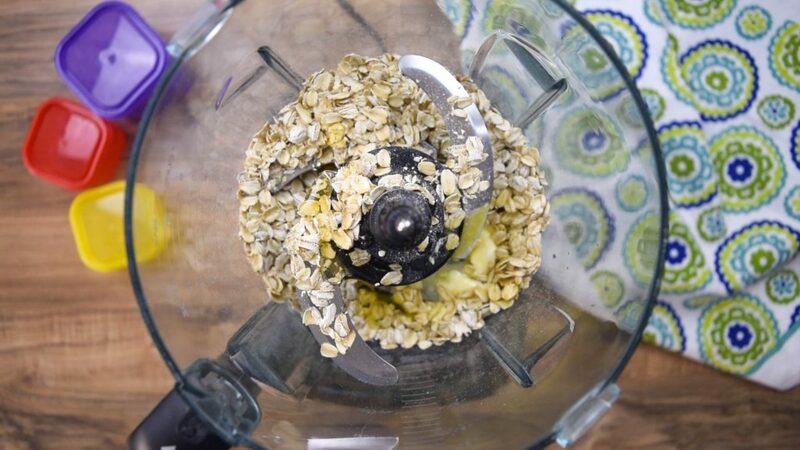 Mix for 2-3 minutes until the oats are chopped. Pour the crust mixture into the bottom of a 6 inch spring form pan lined with wax paper. Press firmly to form crust on the bottom. 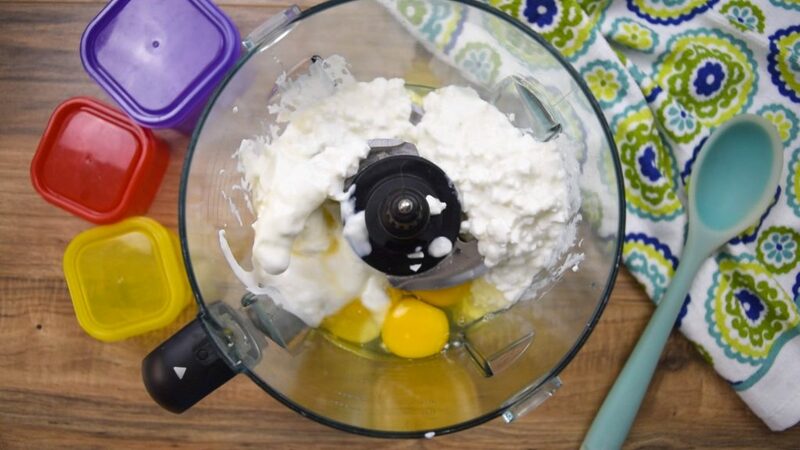 Wash out your blender or food processor and fill it with the filling ingredients. Blend filling for 5 minutes until it is smooth. The filling will be a little watery. Pour the filling into the spring form pan. Tightly cover the pan with foil to prevent water from getting in the pan. Place 2 cups water in the bottom of the Instant Pot, and the trivet of the silicone steaming basket on the bottom with the handle up. Carefully insert the cheesecake into the Instant Pot. Using the manual function cook on high pressure for 35 minutes. Let the pressure release naturally. Remove the cheesecake and let it rest in the refrigerator overnight. When ready to serve top with fresh sliced strawberries. 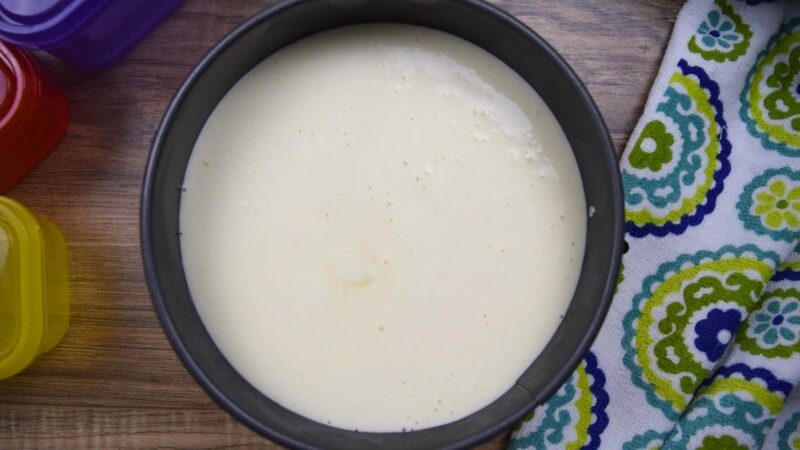 My healthy Instant Pot cheesecake didn’t come out right…can you help? If the video didn’t help you can check out these cooking time adjustments that might assist in your struggle to get the perfect result! I wouldn’t go so far as to say this is a healthy recipe…it’s cheesecake after all! It’s a dessert…it’s meant to be enjoyed in moderation and this version is certainly more healthy than a traditional recipe for cheesecake. 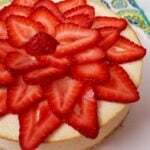 Can I have this Instant Pot cheesecake on 21 Day Fix? 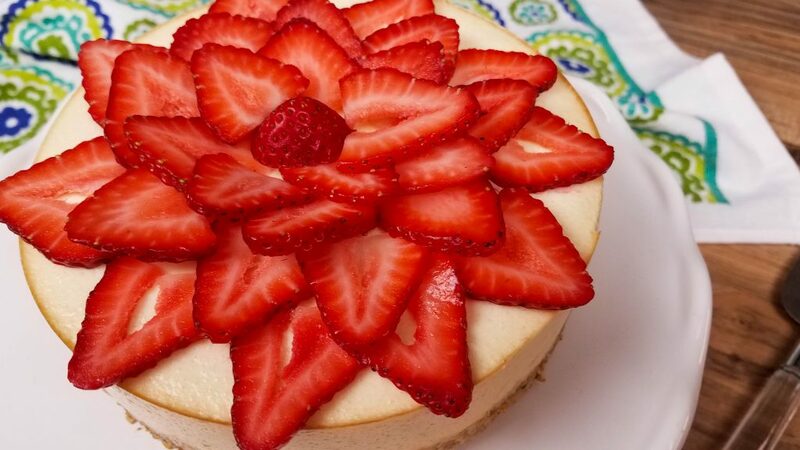 Do you have Weight Watchers counts for this healthy cheesecake recipe? I used 1% cottage cheese and low fat greek yogurt for this calculation for Weight Watchers Freestyle Smart Points. 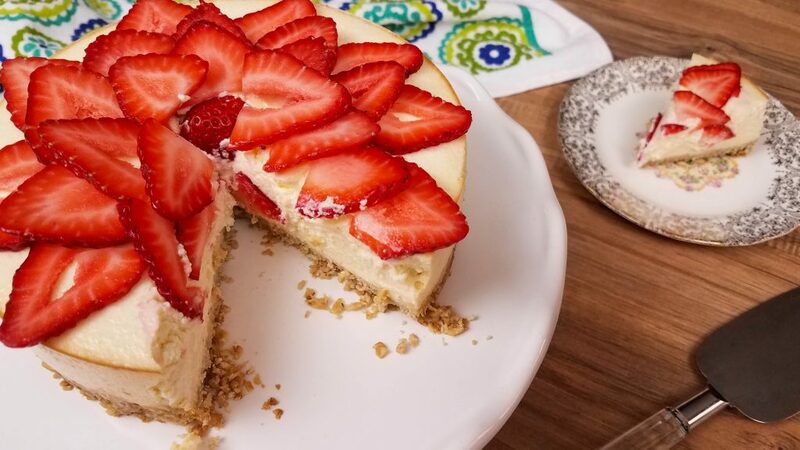 Instant Pot cheesecake is quick, easy, and delicious. 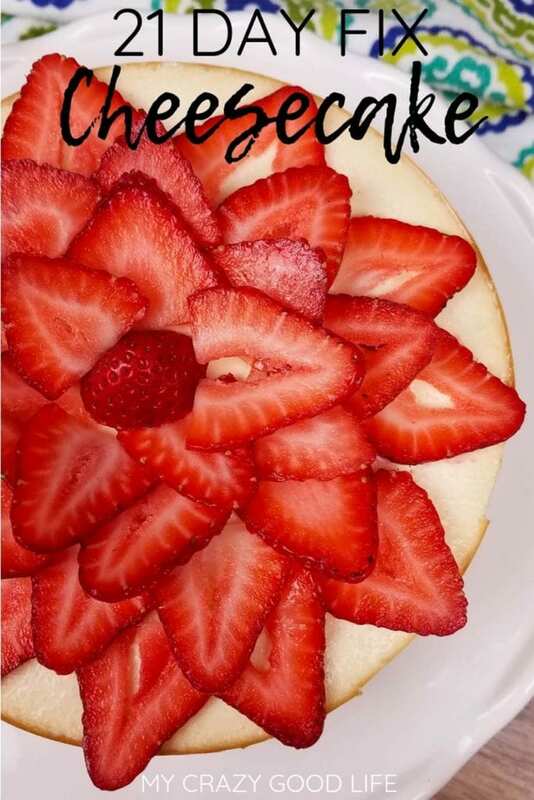 This is a healthier cheesecake recipe that is perfect for diets and the 21 Day Fix! Pour the filling into the spring form pan. 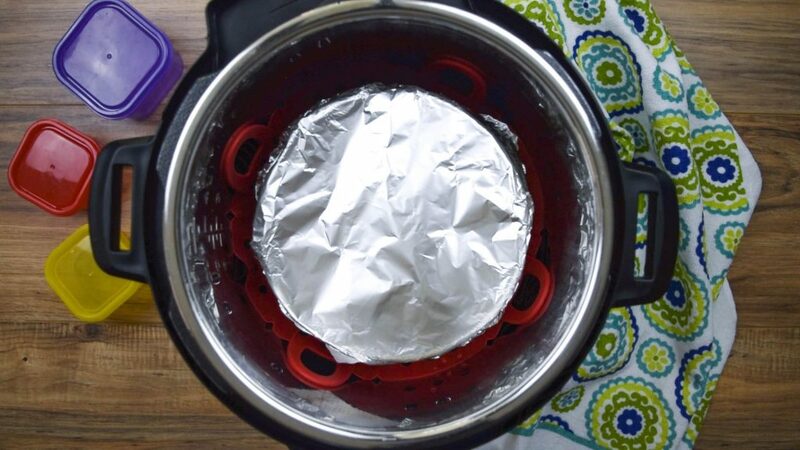 Tightly cover the pan with foil to prevent water from getting the pan. Used Whole Wheat Flour instead of the rice flour and it was still fantastic. Also had to make about double of the crust in order to cover the bottom of my 8” pan but will def make this again! Any tips tho in being able to get the slices off the wax paper without losing almost the whole crust? Yay! So glad you liked it! I might spray the wax paper, even though it’s wax paper and things shouldn’t stick. I’m a big fan of using olive oil spray for everything. Can we use roasted red rice flour in this instead of the norm one? I’ve never used roasted red rice flour, but if it has the same properties as rice flour I think you could try it! I am super excited about this recipe but I don’t have an insta pot. Do you think I could I make it in the oven? What temperature and for how long would you recommend that I bake it?